Over winter break, I had the unique opportunity to travel to Melbourne, Australia. I was invited as part of Team USA to participate in the Australian Master of theAmateurs. The tournament was held at Royal Melbourne Golf Club, the host site of the 2011 President’s Cup and a top golf course in Australia with worldwide accolades. I had an excellent eight-day experience as I learned about Australian culture and faced the challenge that is golf is Australia. We flew directly from Los Angeles to Melbourne on the 15 hour flight that was the longest flight of my life on one of the commercial planes in the world. The challenge is to avoid jet lag upon arrival so we had to stay up until around 6 am ET and sleep for about 8 hours in order to be ready for a full day in Australia. A few movies and books kept me entertained and comfortable seating allowed me to sleep soundly. On the first day we had the opportunity to explore the city of Melbourne. I was surprised at the size of Melbourne. It is a city similar in size to San Francisco and had many neat cultural experiences to offer. The beautiful Yarra River meandered through the city creating many scenic views and many great spots to eat and spend time along the river. The city is very modern with unique skyscrapers and businesses that make for a awesome skyline. Of course the city also offered many American businesses such a McDonald’s, Hungry Jacks (Burger King), and 7/11. After a day in the city we played our first round at Royal Melbourne Golf Club on day 2. It was the summer down in Australia so the golf course played extremely firm and fast. Drives were running out some 40-50 yards and each approach shot needed to land 10-15 yards short of the flag. The greens are known as some of the best in Australia and at tournament time were running 12.5 on the stimp meter. Royal Melbourne is also known for the whipping wind that makes it hard for the ball to stay at rest at times. The fairways were forgiving but if they were missed, the bushes and dangerous wildlife of Australia awaited. All in all it made for a very difficult test of golf. Sports are a big part of the culture in Australia and their sports are very different from the states. Rugby and soccer or football as they call it down under are extremely popular and the national team is followed very closely. Cricket is also a huge part of the national culture in a similar way to baseball in the United States. We knew almost nothing about sport heading into the trip but grew accustomed to the game throughout the week. It is a game in which a bowler, similar to a pitcher in baseball throws a bouncing ball at the batter who is protecting rods behind him called the wicket. The circular field is defended by the outfielders and the batter is trying to hit the ball outside of the boundary or far enough to run back and forth between two wickets before the defense gets the ball back into play. It is a fun game to watch and we watched a professional game between the Melbourne Stars and Sydney Thunder. I enjoyed the experience and will continue to follow cricket from the states. I began the tournament feeling confident in my game and ready for the challenge of a new style of golf. Each round offered a new challenge as the wind varied in direction and intensity, the golf course continued to get firmer and the weather changed rapidly. We experienced 105 degree heat as well as 60 degree days that offered a unique challenge. I played consistently over the four days but not quite my best golf and after rounds of 72-73-71-70 finished in 6th place at 2 under par. My last round was memorable as I played my best round of the week in the most difficult conditions playing my last 7 holes in 4 under par. In the team competition, Brandon Hagy (Cal) and I made up 9 shots in the final round to tie for 1st in the World Cup that included 11 teams. 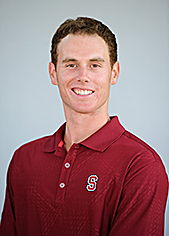 Stanford golf supporters have a lot of reasons to be excited for the future. A 2013 recruit and the number one junior player in Australia Viraat Badwhar took homethe individual title with a 9 under par total. He comes to Stanford in September and his impressive play will be greatly welcomed to the farm. The 2012-2013 team is really excited about the spring season to come and feel that with hard work and consistent improvement we can achieve our goals at the end of the season. 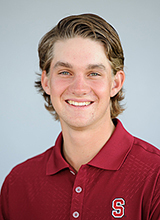 Editor's Note - Steven Kearney wrote this only a few weeks before his best Stanford finish in the Hawaii tournament where he tied for 4th overall and shot 208 to lead the team. It feels like just yesterday that I was writing my freshman year blog. How time flies! Each year has brought both excitement and surprises, and this year has been no exception so far. We started off the season by going to Scotland for an entire week and played some of the most incredible courses in the world. We even got to meet up with the St. Andrews golf team and spend some time touring the city. I also found out that the pot bunker on 17 is even deeper than it looks on television! Our first tournament of the season was at Olympia Fields in Chicago at the same time as the Ryder Cup. After our practice round we were able to make it out there and watch some of the matches. Shane and I were able to squeeze through the crowd to get a glimpse of Tiger on the par 3 17th. After he hit it close we started waving our American flags in the air and joined the crowd who had begun singing the National Anthem. There was a lot of patriotism that day and we all really enjoyed it. This was also the first year that we hosted a match play tournament at Cypress Point in Monterey. To say that it was a unique experience would be an understatement. To play match play on arguably the best golf course in the world is something that college golfers can usually only dream about. One situation that stands out the most to me during the tournament was during the best ball round against Washington. Dominick and I were standing on the 17th tee box with the match all square. We both hit irons off the tee to ensure we stayed out of the giant cypress tree the hangs into the fairway. Then both of the Washington players proceeded to hit drivers and flew into the tree, leaving them with no shot to the green. We ended up winning the match because of that hole. It just goes to show you that playing conservative in some situations can really pay off! Our year is going well so far. We finished off the fall season by giving UCLA a run at the Gifford Invitational at Corde Valle. After Cameron’s incredible 61 the first day, we found ourselves neck and neck with the Bruins on the last nine holes. Unfortunately we weren’t able to pull through and lost by a few shots, but it was a great feeling to see everyone grinding it out to the very end. We will see them again many times throughout the rest of the season and I have a feeling it will be a different story next time. The quarter proved to be a challenge academically for the entire team. Playing five tournaments means a lot of time away from school, so everyone has to be on top of their school work and manage their time well. I wrote a 25 page research article for one of my classes. Shane, Cameron, David, and I also wrote a 60 page paper for our group project in another class. Although it can seem like a lot of work at times, we are all used to it by now. We were even able to participate in a community service event with the Boys and Girls club in East Palo Alto. We played soccer and dodgeball with underprivileged youth at an elementary school. Let’s just say that most of the guys on the team should definitely stick to golf! I was fortunate enough to be able to go to the PAC 12 Championship and the Rose Bowl this year to watch our football team make history. Let’s follow in their footsteps on our way to the 2013 NCAA Championship! Go Card!